As sparks flew, the hits just kept on coming at the Combine Demolition Derby on a Saturday night in early September. Yes, you read it right…a demolition derby featuring COMBINES, the farm harvesters that typically peacefully gather in grain. 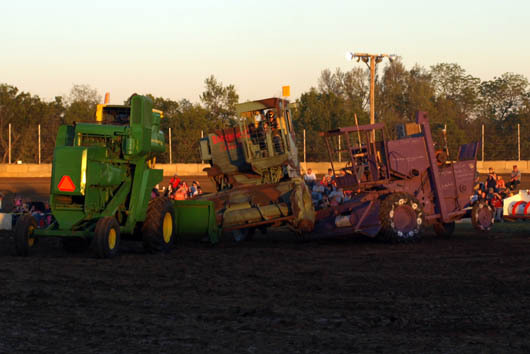 At the Humboldt Speedway, these massive farm machines revved their engines and charged header-first, crashing into each other with a loud bang as metal crunched, the rear tires of both combines lifted off the ground and the drivers jolted in their seats. [[endteaser]] No longer needed on farms, the machines are stripped of glass and protruding parts such as the auger. The header is reinforced because if it falls off during the competition the combine is eliminated. Many sport new paint and carry amusing nicknames such as Hill Billy Hornet, Hefty Smurf, Aqua Man, Poppy and Backwoods Barbie. A sense of humor prevails at these events. On the Love Bug, decked out like a bright-colored lady bug, were written the words “Fool Injected” near the cab. When Brown Cow, painted brown and white like a Holstein cow, was slammed by Rosey, the derby announcer bellowed “How now brown cow?” over the loud speaker to the cheers of the crowd. A bumper crop of 26 combines from Kansas, Missouri and Oklahoma were in this year’s competition, so there were several heats where metal smashed, tires blew and parts fell off, leaving the big machines either damaged beyond repair or wobbling off to be quickly fixed for the finals. A winner was finally determined after maneuvering through a field of debris while giving the competition a thrashing. Shriners in the area host the Humboldt Combine Demolition Derby, in its third year, as a fundraiser for the organization’s various projects. Most involved with the event – from ticket takers to drivers - agree it’s all about having a great time putting on a good show for the crowd for a good cause. As one younger driver told me, “It’s fun breaking stuff and not getting into trouble!”And did I mention the evening included a Figure 8 Race with cars where, as the announcer said, “The rules are there are no rules!”While car demolition derbies are common in Kansas, I found only a handful of other combine demo derbies including in Abilene, Cheney, Hays, Hutchinson and Salina.Have you been to a combine demolition derby?